First of all, apologies for the long delay in writing this blog. I'm sure fans of Totally Acoustic the length and breadth of the country - NAY the WORLD - have been desperate to find out what happened at the show a couple of weeks ago, but I'm afraid this REPORT was delayed by me going on holiday the next day... and then, when I got back, thinking "I might as well wait until I've done the podcast before I blog about it." Well, the wait is OVER for LO! I have done the podcast and you can hear it RIGHT HERE! You may well notice, in your listening, that the starting theme tune is missing rather the usual LEAD BARITONE during the OOH in the theme tune. This is because Mr S Hewitt was not in attendance. If this sounds scarcely believable then a) I feel your pain b) I took a photograph of him not being there to prove it. This was my first ever LIVE performance of Hills And Hollows and I did it as a POEM because a) that was how it was originally written b) we had POETRY later in the night so it seemed fitting to do it that way and c) I had no idea what the chords were on the recorded version, as it was done as a JAM. It seemed to work OK, I might do it like that again! 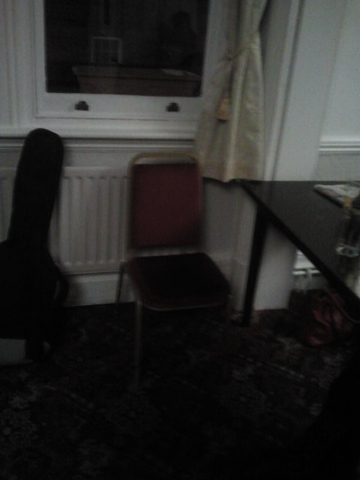 After me we had Mr Royston Vince and a HOST of guests doing a LOVELY set full of covers, also HARMONIES. The band that gradually accrued around him featured a young man doing that thing where he plays drums by sitting on a BOX and slapping it. It always sounds dead good, and makes me wonder why drummers make such a fuss about having gigantic KITS. Guys! Just get a box! Next up was Ms Molly Naylor who, after worrying about whether to use a STOOL or not (the King & Queen now has a BAR set up where the performance area is, and there had been bar stools set up before it), did a WONDERFUL set that made me feel bad/stupid for saying "Poems is easy" earlier on. I really like the fact that we have loads of POETRY at Totally Acoustic these days, it's always GRATE and she was no exception. We finished with the ever-marvellous Mr Martin Austwick who had also bought a BAND with him who sounded FAB. Indeed, I feel they may have got TOO used to sounding as good as they did, as they tried to engage the audience in some participation involving MASSIVELY lengthy and complex harmonies. Chaps! We are an audience! We will go "WHOO-OOH!" and possible singalong with the chorus, but we shall leave the fancy stuff to YOU. Although, actually, thank you for thinking we might have been up to it. It was, as ever, a lovely evening which somehow ended up with me getting DRUNK and staggering out at 10:30pm suddenly aware that I had a plane to catch first thing the next morning. As stated previously, that all worked out very well indeed, but I think for the NEXT show I'll try and stay in the country for a couple of days afterwards!